How I spent my Winter Solstice vacation! 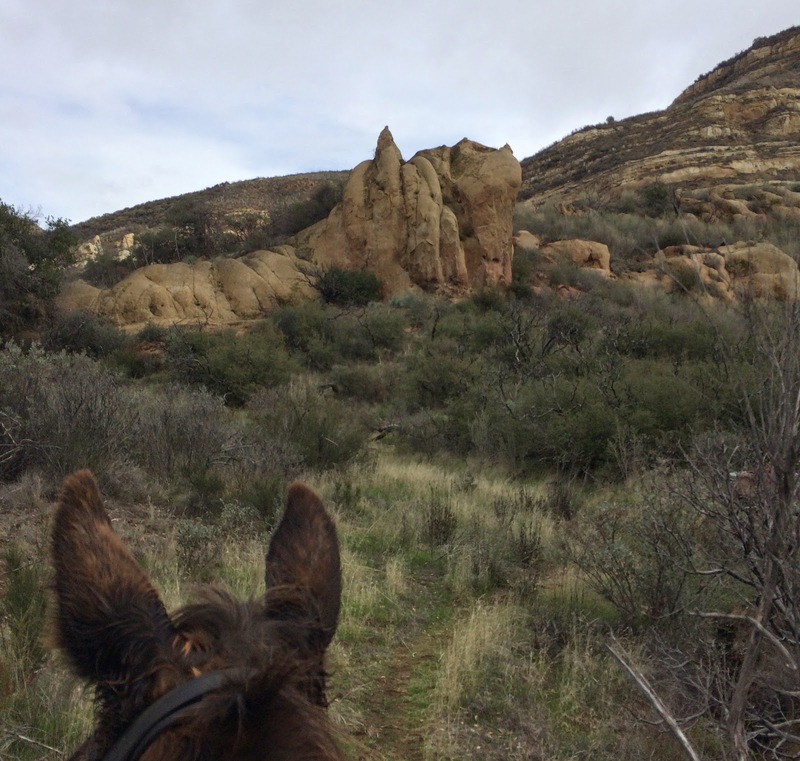 On the evening before Winter Solstice I loaded up the Mule Mobile and headed out for adventure. 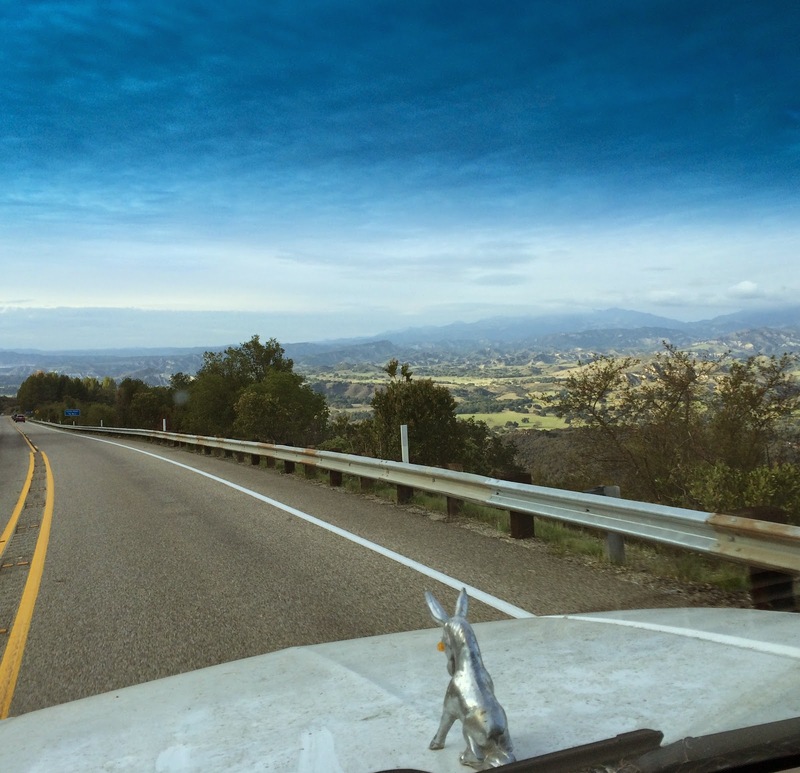 There had been a recent rainstorm, and the mountains we were soon to explore are out on the far distant horizon, shrouded in clouds, across the Santa Ynez Valley. Our goal was Nira Campground, and in order to make an early start the next morning we got there just at dusk, in time to park the rig and give Tobe a good feed and settle in. The humans gathered around a campfire and told tales of hiking adventures, sharing stew and wine and bragging rights for distances covered, heights conquered, arduous challenges surmounted. The campground has parking for the many day-use hikers and ample grassy spots for tent-pitching. 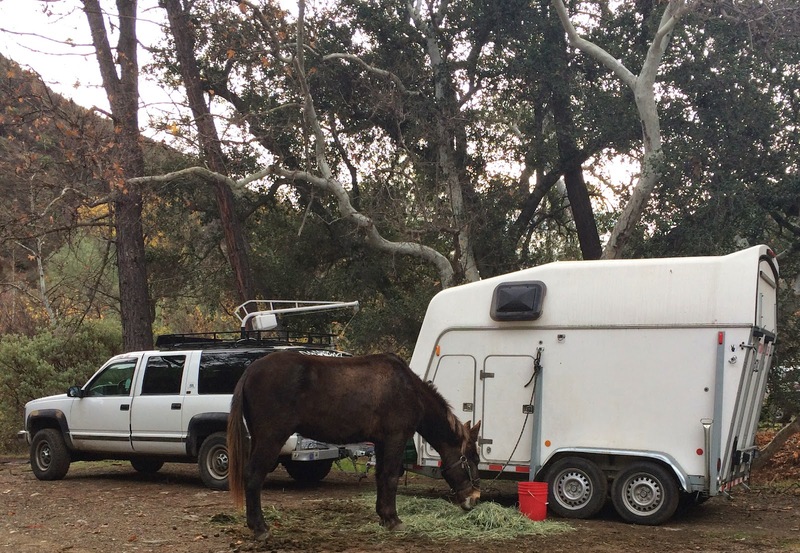 Very large turn-arounds can accommodate multi-horse trailers. There is no water, and trash must be packed out, but there is a cement building with real toilets. The next morning more of the trail repair crew arrived and had a crack-o-dawn safety meeting and scope of work instruction. 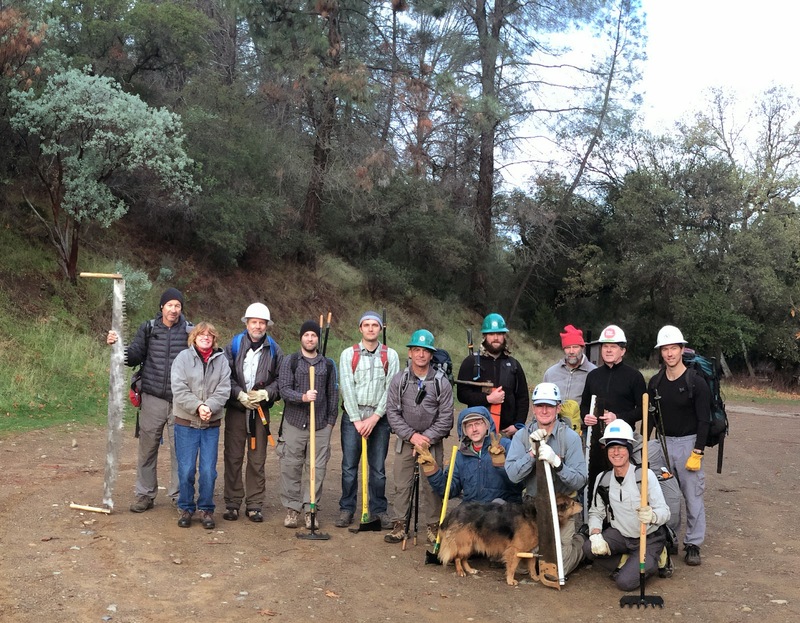 All of them are volunteers, but through an arrangement with the US Forest Service are covered for injuries while on projects like this. The crew leaders do their best to teach tool safety, promote best work practices, and are proud of an excellent record of safety and accomplishment. 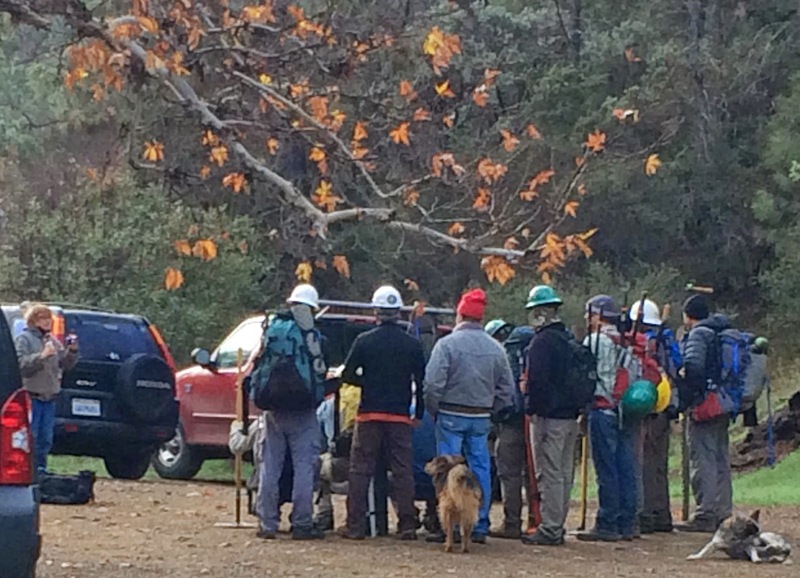 Here's the hearty crew, armed with tools and hard hats, ready to set off to clear downed trees and clear trail obstacles. 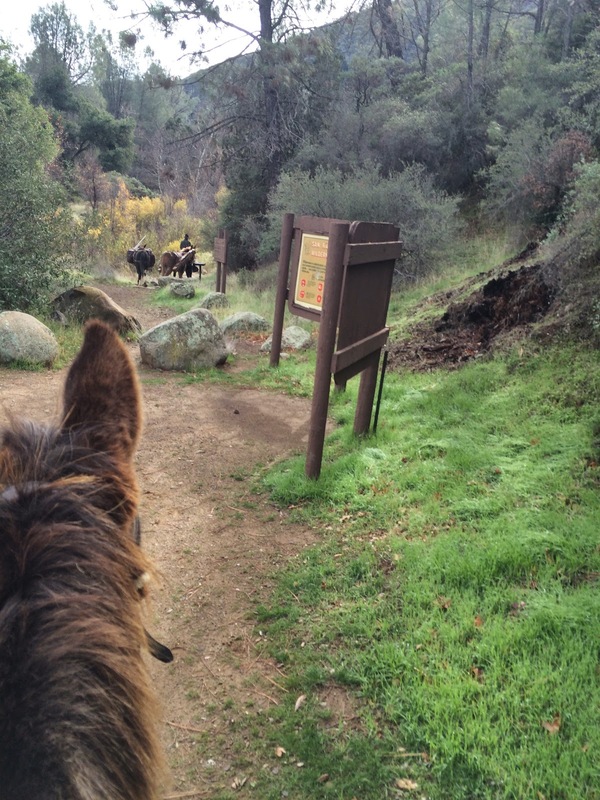 The crew leader had recently walked the trail and so was able to describe to them the trouble spots they would encounter. 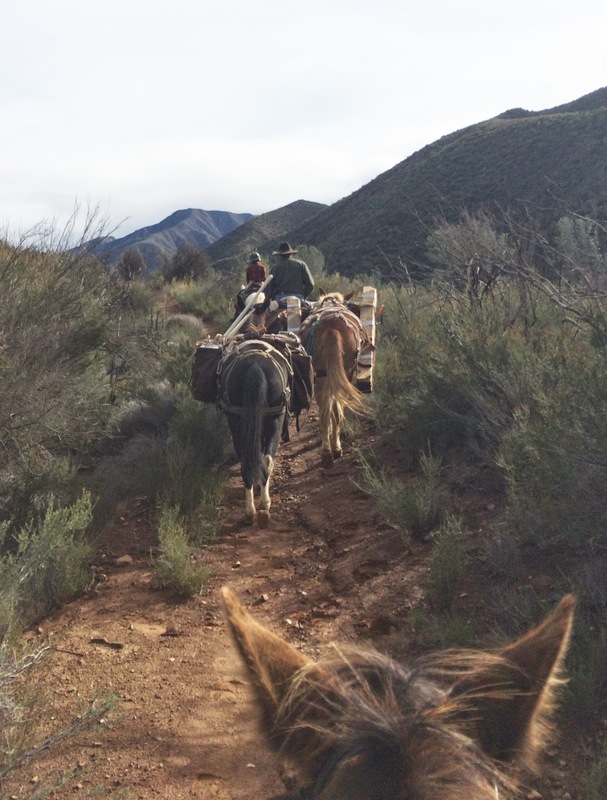 They set off at 7AM and the pack animals made a plan to follow them at 10AM, since without their efforts we could not get through. 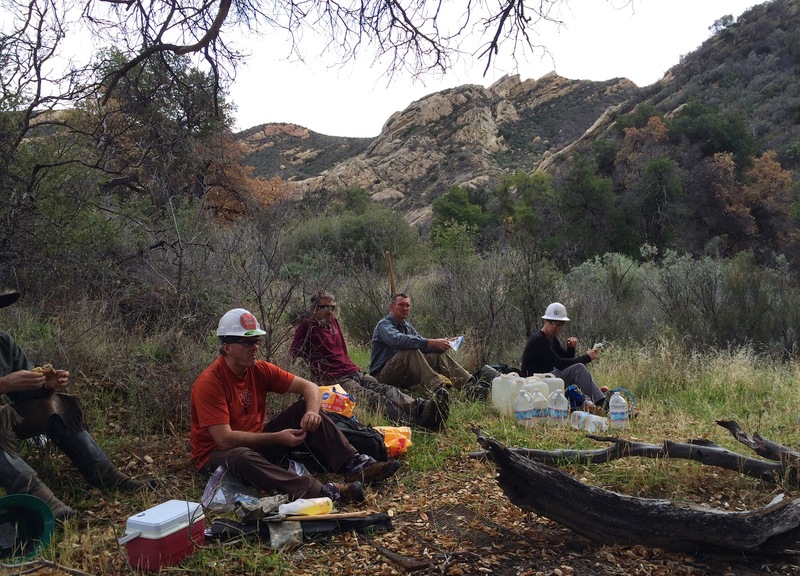 This group of sawyers is part of the Los Padres Forest Association Volunteer Wilderness Rangers (LPFA - VWR). 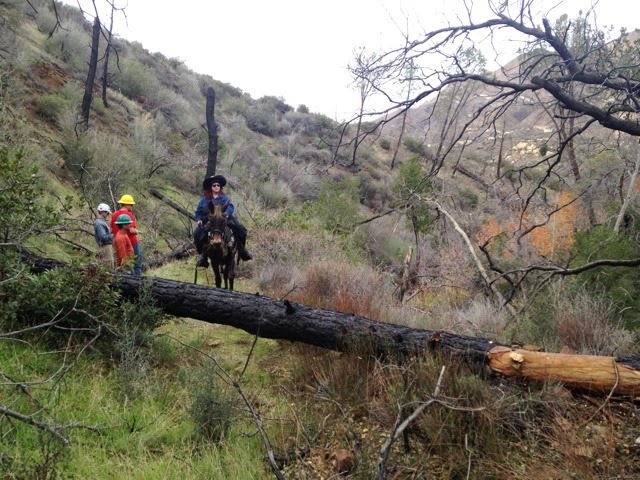 They are responsible for cutting and removing downed trees and repairing the tread for hikers and stock to pass over safely. At the Nira trail head, off onto the day's adventure. I have never been in this area, and had no idea what to expect. 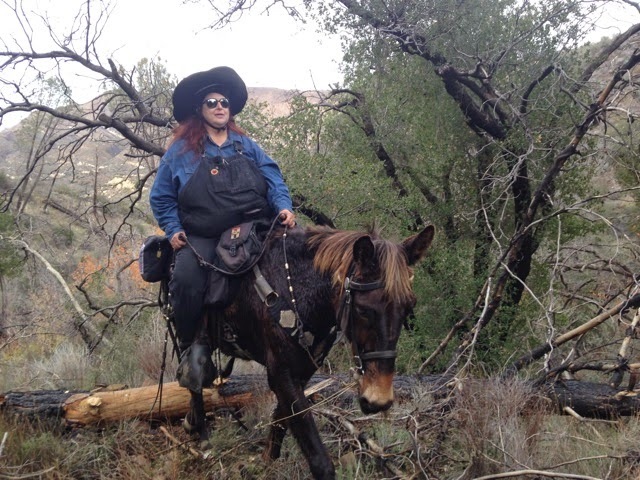 But I was with highly seasoned packers and so they took care of leading their pack animals and all Tobe and I had to do was bring up the rear. I wasn't necessary to the scheme of things, I was just along as a guest. 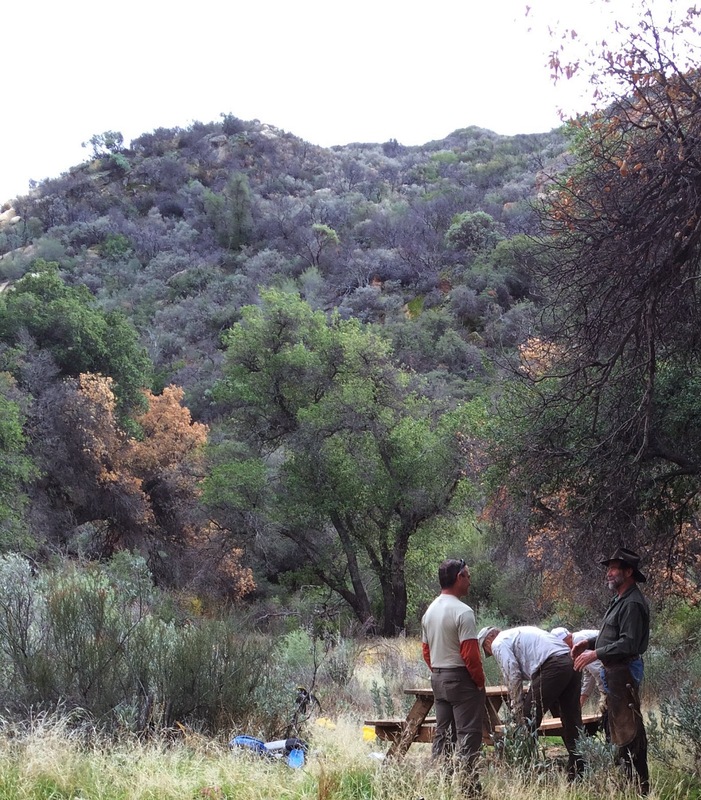 Nira is in the San Rafael Wilderness, part of the Los Padres National Forest that is directly adjacent to Santa Barbara. To get there you go to Santa Ynez and head East on Happy Canyon Road, then out Figueroa Mountain road This part of the trail is a walk in the park compared to what we were going to encounter. Because of the recent rains, the 3 year drought has hopefully come to an end, and the trees were already showing new foliage and grasses were sprouting. I felt so fortunate to be out there as the canyons bloomed into new growth, and water was once again flowing in the creeks. 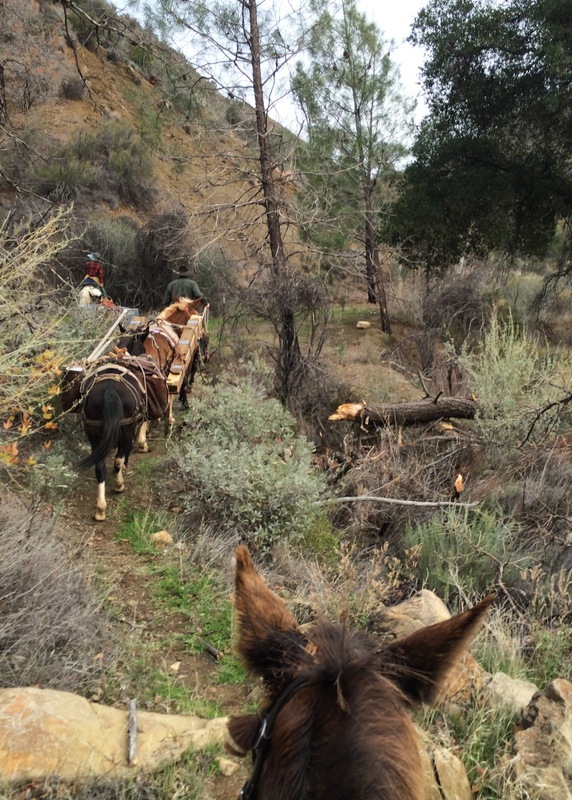 We followed behind the crew, and saw many trees that had been cut and moved off the trail. 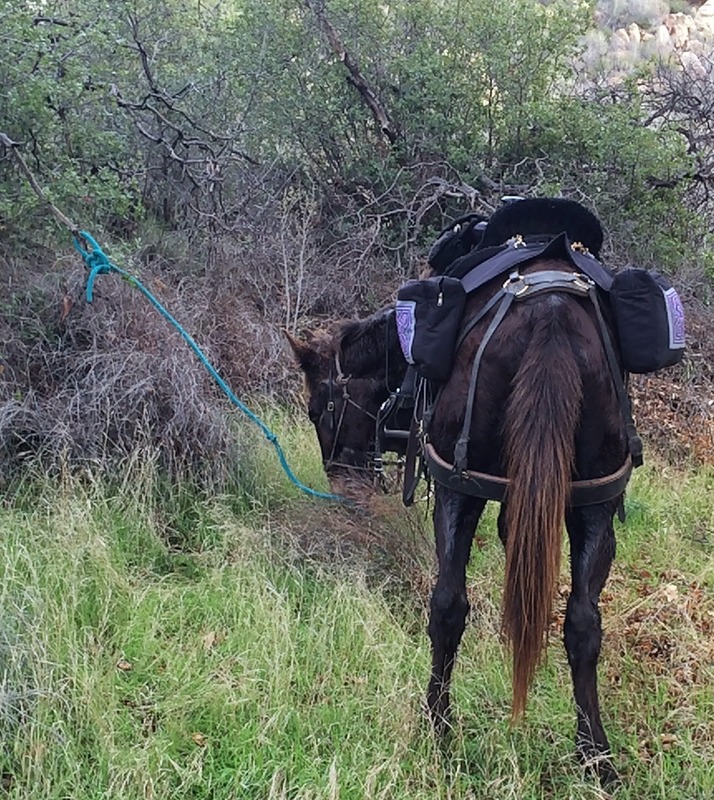 Even so the picnic table that you can see strapped to the big Belgian mule was rough going on some of the thin trails, and care had to be taken not to have her bang the load. 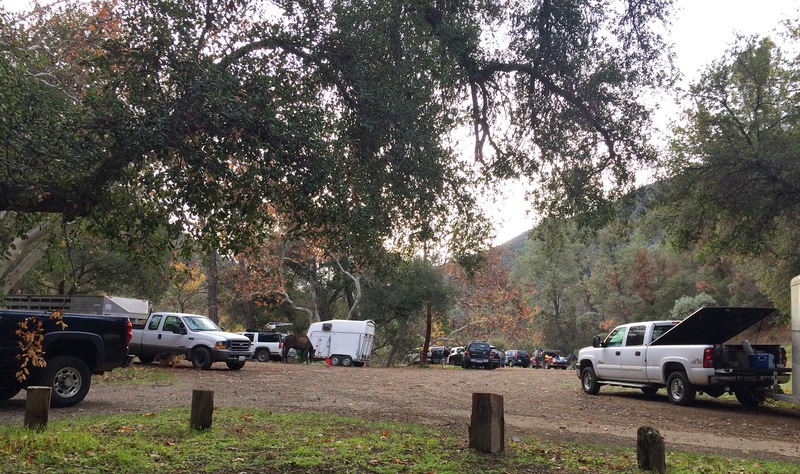 Three pack mules carried in the table and a large cache of water, all to be left up at the Twin Oaks campground for hikers in the future who might need them. This is truly wild country, the tiny trail snaking through it that we followed has very little impact on the overall sense that only a few very hardy hikers make it up to see these vistas. Over the other side of those distant mountains is our home in Santa Barbara, but it feels impossibly remote. Technically this is called Front Country, so easily accessible from civilization. 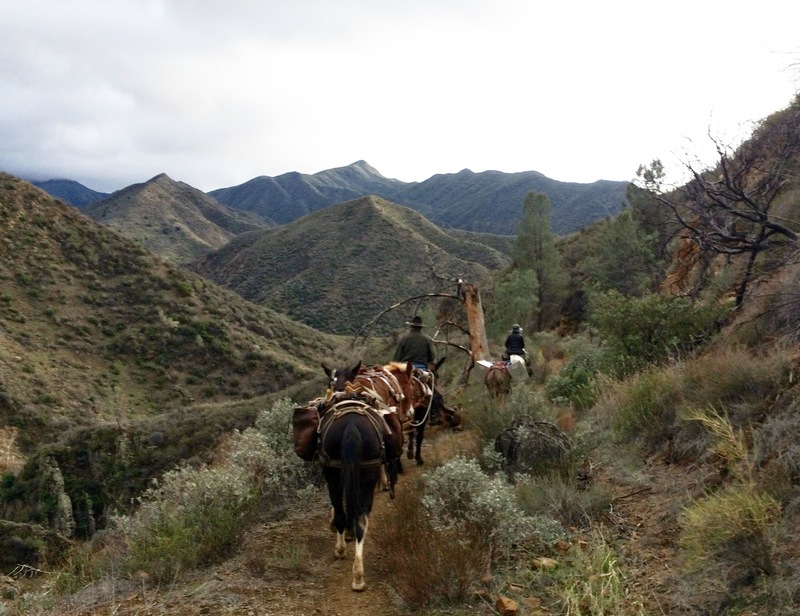 But walking through it on a mule at 3mph feels like stepping back in time a century. The sandstone rock formations rising up above are vividly colored now because of the recent rain, beautifully contrasting the chaparral and sagebrush. If only a blog could have a scratch-and-sniff capability, to be able to transmit the scents of traveling through this country. As the animals brush past sagebrush it releases the heady scent that anyone who has spent time in Southern California remembers vividly. Here you can see the trail crew at the top of the photo, beavering away on the trail-obscuring trees. 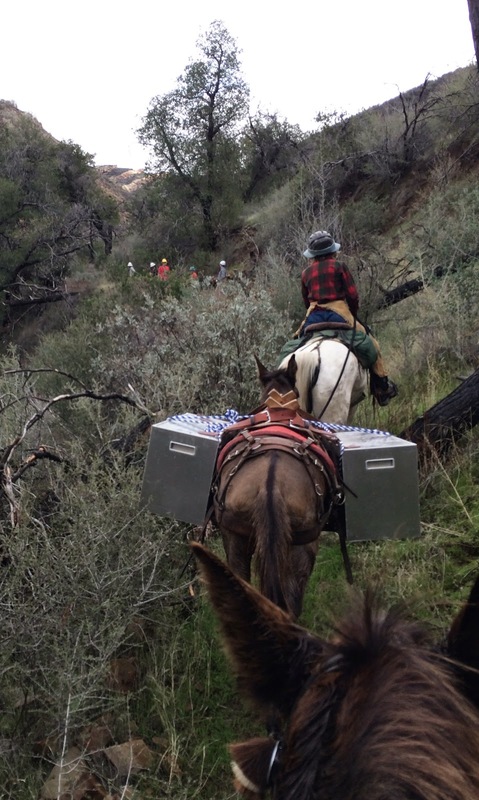 At this point we had to wait for the crew to clear away a downed tree before we could get the pack mules through. 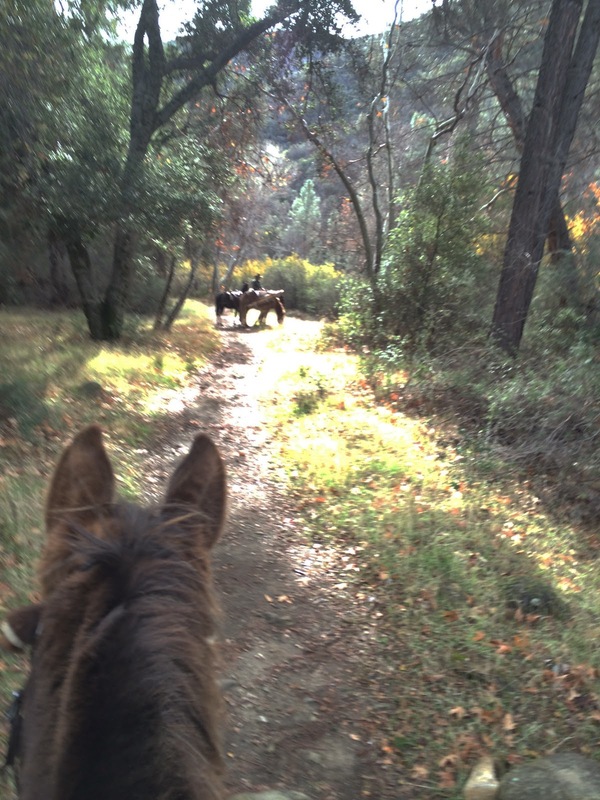 Of course, being mules they didn't need quite as clear a path as some other equines. But those metal "bear proof" panniers full of jugs of water were quite a challenge. In many places they would bang against rocks or trees, setting up quite a racket. There's a sequence of Tobe and I approaching a downed tree, going off-trail to turbo across it in the brush, and then cruising through a recently sawed out log to continue on up the hill. Once upon a time there were government programs like the Civilian Conservation Corps that sent workers out to maintain trails such as this one, but no longer. Now it is done by volunteers, people dedicated to exploring the wild places who put in this effort so that others can also enjoy these special moments of solitude and union with nature. And finally on the terrain above we see The Beehive, lit up in the afternoon sun, the marker that tells us we have arrived at Twin Oaks camp. Tobe sees it too, and stared quite a while. Might he be wondering if he's going to be tasked with getting me to the top of THAT also? But no, this was as far as we were going, and the crew who had gotten there ahead of us were spread out on the new grass, taking a well-earned break and eating lunch. Tobe had lunch too, and tucked into the lawn buffet with vigor. 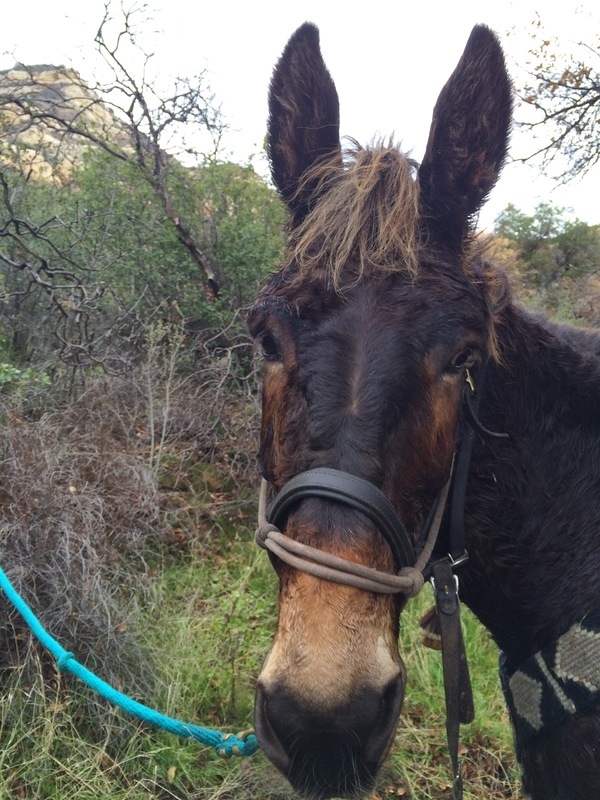 He had a couple of enjoyable rolls on the ground also, a mule's gotta do what a mule's gotta do. It is his yoga. Then he stood patiently and rather gratefully for the two hours we spent in camp. That time was needed for the picnic table to be unloaded and assembled for future use at this campsite. This particular table has quite a past. Seven years ago it was made by two men who were intent on carrying it up to the McKinley Saddle ..... when suddenly they saw smoke on the horizon, the beginning of the devastating Zaca Fire that eventually burned over 240,207 acres. One of the men is a prominent local journalist known for his ability to get inside fires and take breathtaking photographs, so the table was dropped where they stood and they hustled down to go to the fire, which burned for 4 months, so it was a long time before they went back and retrieved what was left of the table. Now, phoenix-like, it has been revived and carried up to the Twin Oaks camp and will be there for many years to come, making camping there just a little more pleasant. After the table installation and the rest break we headed back down. 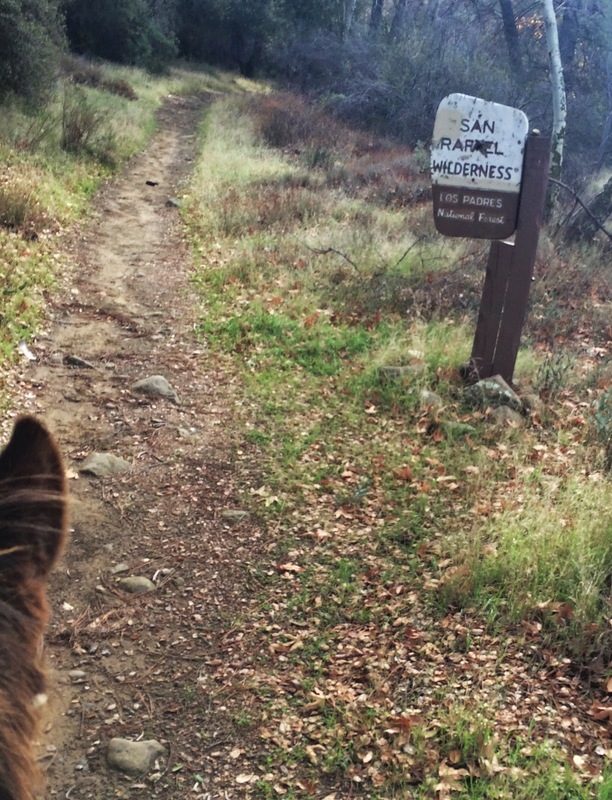 What, why are we missing the photos of the 1' wide trail across the shale traverse? Why no video capturing the almost vertical cracks in the canyons that we had to negotiate by plunging down, crossing streams, and then powering back up the other side??? 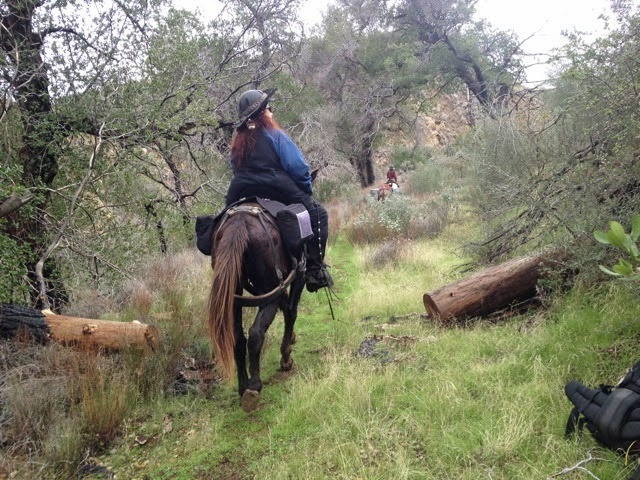 Quite simply there are no photos of those because it was all I could do to hold on, put my trust in my fabulous mule, and stay steady and centered on his back as he did what he does so well. Getting out the iPhone and taking a photo, well, that was asking too much of me. 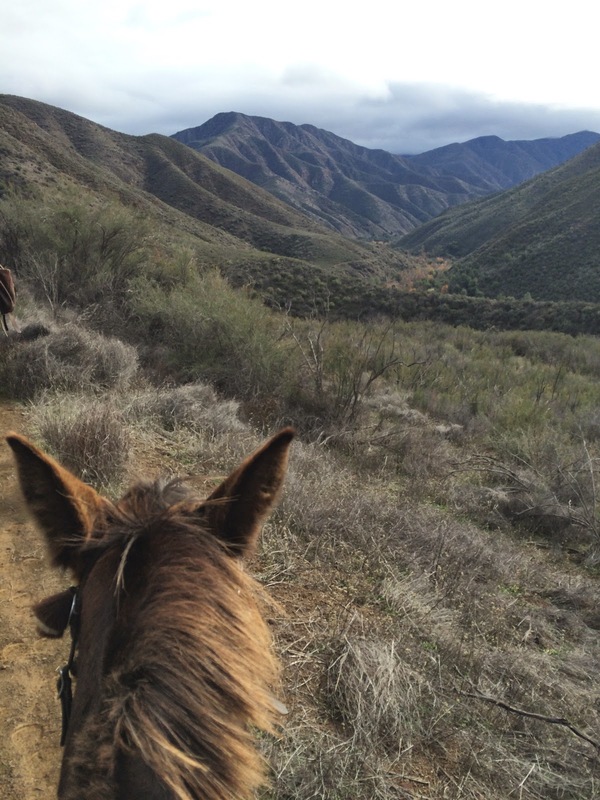 Maybe on the NEXT trail ride I'll capture more of the hair-raising bits for this blog. Stay tuned! 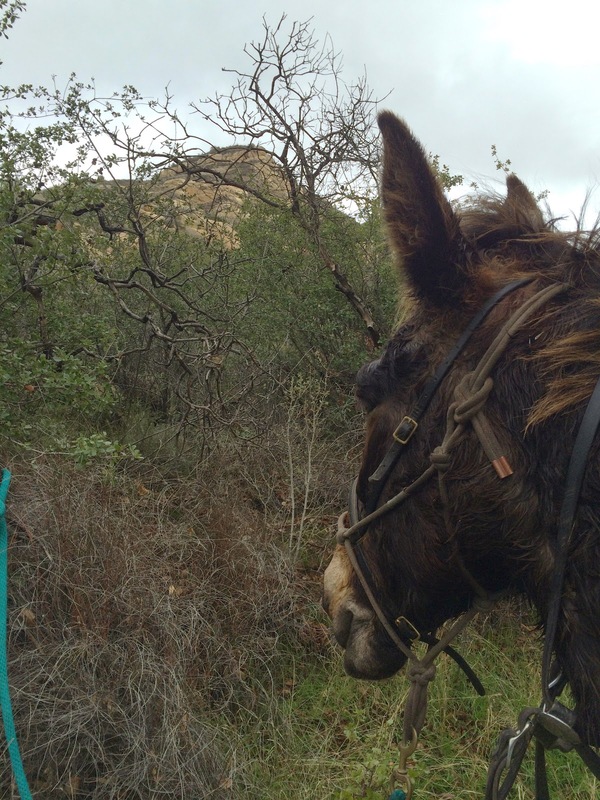 Tobe Mule is a pretty modest guy, but I say it was all HIM that got us up and down this mountain. 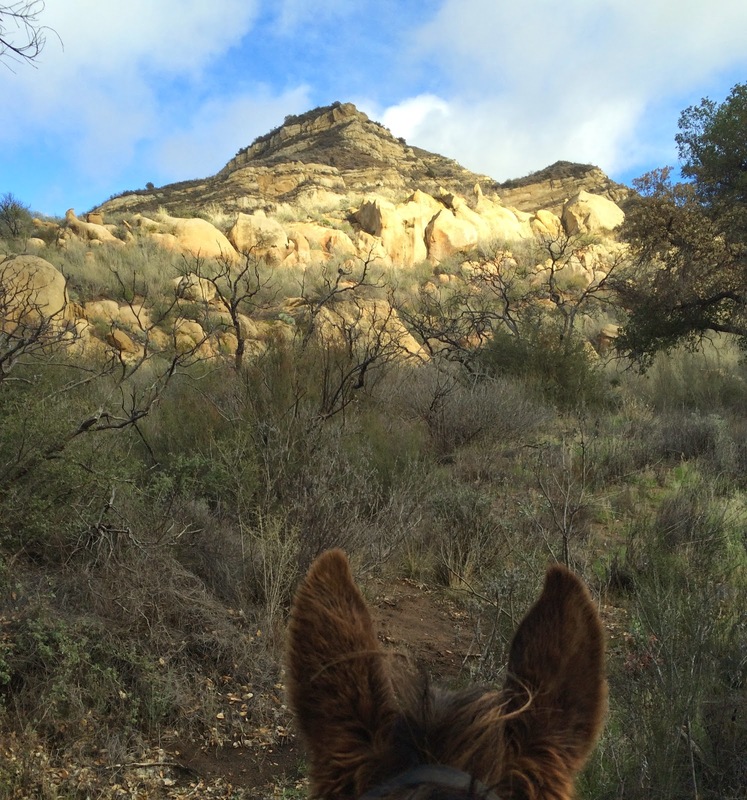 For me, it was a great return to strenuous riding and I am very proud of us BOTH for living this day. 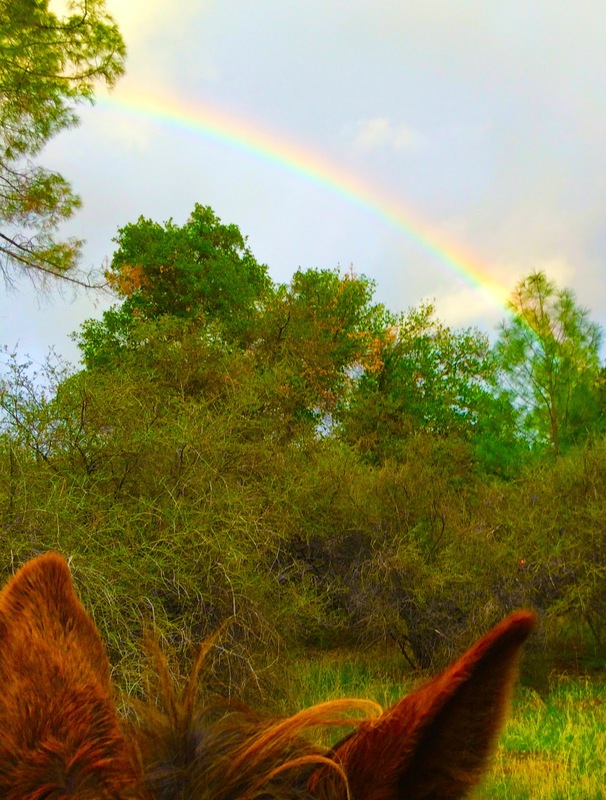 We went to the rainbow! For those who like statistics, the trip up was 5 miles in 2 hours, average speed roughly 2.6MPH. We ascended from 1,745 ft to 2,849 ft. On the way down we went a bit faster, 1.4 hours and an average speed of 2.9MPH. 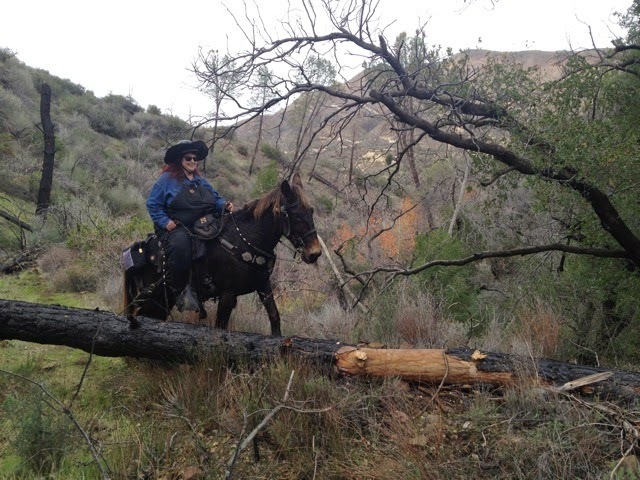 I would call it a challenging and strenuous ride on an equine, with many very narrow trail sections with steep drop-offs and lots of descents and ascents through steep canyon walls. For a walking fit human it is probably a moderate hike.